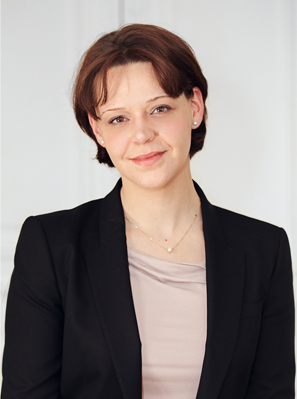 Patricia is your primary contact for all matters dealing with corporate law. Together with our team she advises and assists our clients, French or international groups, in all legal matters, whether current operations (formation of companies, annual general meetings, appointment or dismissal of the executives and corporate officers, etc….) or more complex matters and in particular restructuring of companies (mergers, spin outs, partial contribution of capital, restructuring of the share capital or liquidation of companies). Patricia is also active in all transactions concerning private equity, sale or purchase of companies or businesses. She has gained a strong experience in this field and is involved in all stages of the operation, from the legal due diligence, the strategic considerations based on the issues deriving out of each individual case, the conduct of the negotiations to the finalization of the agreements and finally the dealing with post transactional issues. Her activities have brought her to finalize transactions for small and medium-sized corporations as well as multinational companies, whether in French, English or German, that she speaks and writes fluently. Besides corporate law and mergers and acquisitions, she also dedicates a part of her activities to employment law, both in the field of counseling and litigation, and assists the clients in all aspects and management of human resources. Patricia is member of several international bar associations.